Today I headed to the O2 which is something I don’t do a lot, despite living just down the road! Usually it’s because there are way too many people as there is always a concert on, and today was no exception (Frozen On Ice, there were tiny Elsa’s everywhere) apart from that I headed to the Star Wars exhibition. 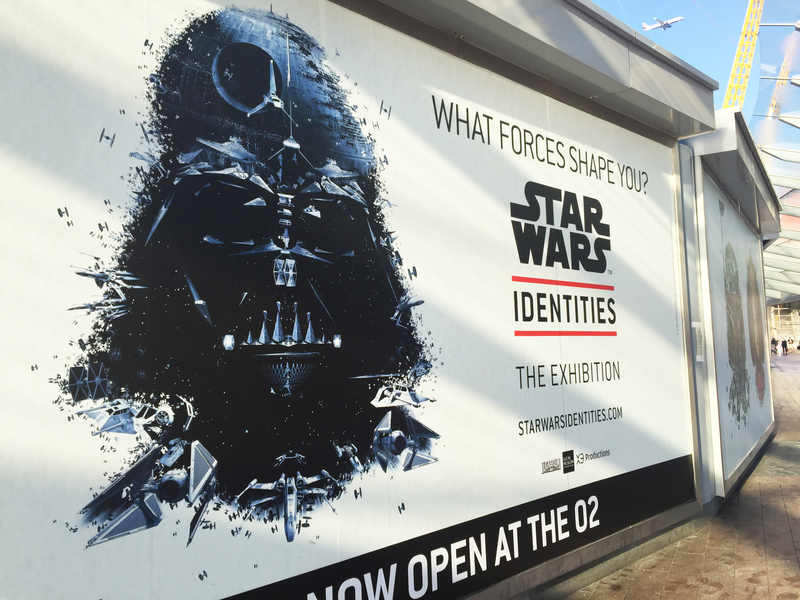 The exhibition, fully named Star Wars: Identities, promised an interactive exhibition of around 200 Star Wars props and costumes from all of the films. I bought the tickets as a gift for my Dad on his birthday and he, my sister and I went along to check it out. Our time slot for the exhibition was 1.15pm and they literally don’t let you in until your allotted time so be warned – don’t turn up early! It also took a while to get in as there is talk you have to listen to before the tour begins and this takes a little while, but it all becomes clear why eventually! When you arrive you’re handed a head set and a wristband. The wristband tracks your movement around the exhibition and in each room you’re asked questions to which the answers are recorded on the bands and then at the end of the tour your Star Wars ‘identity’ is revealed. The headset is some pretty sci-fi technology too. If you stand in certain parts of the exhibition you can hear commentary as you move around the rooms – very handy when you’re looking at old illustrations of props and characters and are thinking what on Earth am i looking at here. 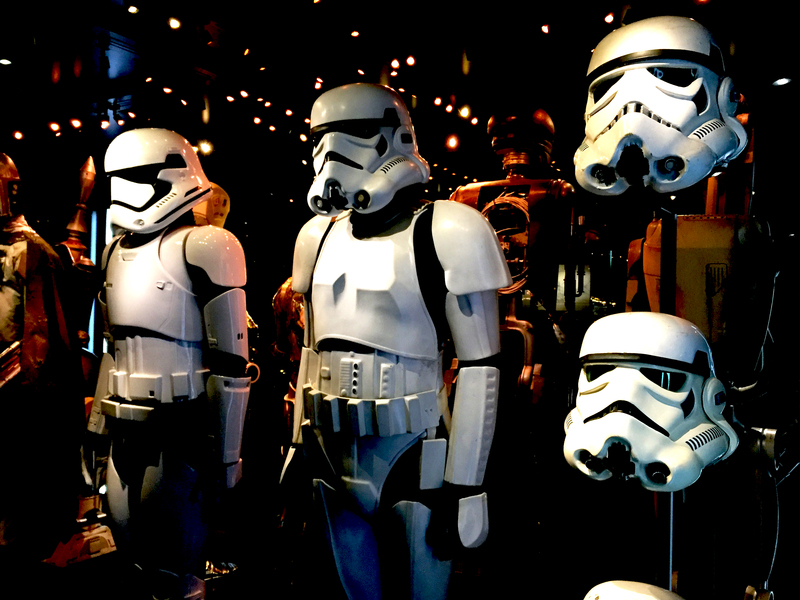 Famous costumes that are on display include full suits of Stormtrooper armour, the famous droids from the films (C3PO, R2-D2 and BB8) as well as various robes and outfits from both the dark side and the jedi characters to name a few. 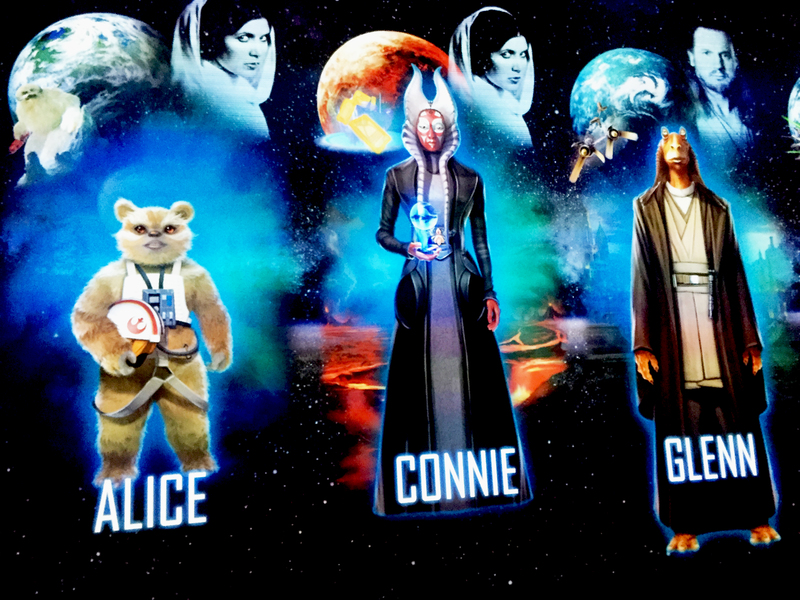 It’s a major geek out for any Star Wars fan, but also impressive even if you can’t tell Ja Ja Binks from Jabba the Hut. Amongst all the memorabilia, one of the most bittersweet items on display was one worn by Carrie Fisher as Princess Leia in the famous scene where she is held prisoner by Jabba the Hut before strangling him with her chains. As she died just before I visited the exhibition, it was pretty sad to see this! There were also some really interesting character sketches that show how some of the characters were developed. In one original storyboard, Luke Skywalker was going to be a female princess character but then George Lucas split the character and made brother and sister Luke and Leia instead. Well, interesting stuff for Star Wars fans anyway! So, obviously after we’d visited the entire exhibition we had to find out what our identity was….and I wasn’t expecting how hilarious it would be. The first time in my life i’ve been shorter than my sister. It was such a fun afternoon and at £25 each I didn’t think it was too pricey at all – it’s certainly more than wandering around and looking at things behind glass, it truly is interactive. And if you’re a Star Wars fan, or even just getting into it after seeing Rogue One, you’ll be in your element!